Makeover: Teen body parts at risk! Here’s the first in a sporadic series of makeovers. I’ll grab some elearning that might need perking up, add some perk, and put it here for you to critique. The first sample comes from the US government, which published Teen Worker Safety in Restaurants. There’s a lot to the site, but I’ll focus on just one aspect. Like many instructors, the authors tell, and then they show. I think it can be more powerful to reverse those steps and show, then tell–especially when you’re talking about possible amputation. What is machine guarding? When moving machine parts have the potential for causing severe workplace injuries such as crushed fingers or hands or amputations, machine guarding eliminates or controls these hazards and provides essential and required protection for the worker. This is followed by lots more text, including regulations. Next to that text are three photos. I’ve used the last photo in the rewrite. 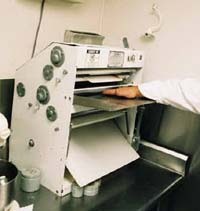 Will this worker’s hand be crushed by the pizza crust maker? Machine guarding protects workers from moving parts. We started with a question and compelling situation. We used the question and a picture to show the need for machine guarding instead of telling about it. We chopped the “telling” text down to a few words. What are your ideas? Critiques? I love the idea of your doing little eLearning makeovers. Great idea! In this example, you took a wordy, jargony definition and turned it into a scenario — adding an element of risk to create that all-important emotional connection. Much less boring. So you’ve got me looking at a storyboard I’m currently in the midst of to see where I can turn the content around like this. I agree that the client would probably rebel, especially because the site appears to have been written under the influence of lawyers. I’d remind the client that the goal of the material is to change the learners’ behavior. They’re supposed to make sure all machine guards are in place. As a a result, I’d argue that the material should emphasize the need for the guards and not focus attention on a legalistic definition that actually had little content to start with. This could be a hard sell, however. It seems to be a common assumption that elearning just needs to impart information and that once exposed to this information, the learner will change their behavior. So we design for content, not behavior, and we let the lawyers write our courses. Cammy, I’m not sure it’s as sad as that! We’ve survived content-centric instruction for generations. I’d just like to see us move toward elearning that engages the learner more and is designed to meet business goals. Great idea! I’m keen to see more of these makeovers, keep up the great posts ! Cathy, I’m with you. I’ve just been having a bad week with lawyers….they make me sad…. Cathy — Just came across your blog via a link from Jeff Cobb’s Mission to Learn, and I’m glad to see such a direct, hands-on approach to ID in the blogosphere! Maybe you suggested this and I missed it — but in this example, why not make the definition a “Read the Definition” or “For More Details…” link to click-thru information? That way, it’s out of the linear lesson path, but still available for those who want/need that level of detail? Keep up the great work! I’ll be adding a link to your blog from mine, as it handles this topic so well! Thanks for the kind words! Your link to more details is a great solution for when a client wants to make sure certain wording is preserved. Definitions are always a sensitive area, I think because they were given so much weight in school. The “machine guarding” definition is an example of a definition that uses many words to say very little. Good demo. Getting to Cammy’s review, it’s important to get to the essence of the content. Why is it important for the learner? In some ways, elearning is a catch 22. Many of the courses we have to create are really pointless and only the result of some sort of fear of lawsuits. That’s why so many sound like they were written by lawyers and aren’t really focused on the learner. If definitions, for that matter, just any component of a teach is redundant, then why not discard that all together? A definition as a raw content cannot qualify as a teach simply by virtue of it being the definition. It’s after all, not the definition which is important. What is important is what the learners learn from the definition. If an explanation, usually effected through a scenario is comprehensive and engaging enough for helping the learners do the needful, then why not come to the explanation straightaway? A heading stating the name of thing explained with the explanation following can suffice. This has a two-fold benefit. From the design point-of-view, it’ll save precious screen space and from the business point-of-view, it’ll economize on production time and cost. There is little point in giving the actual definition even as a “Read the Definition” or “For More Details…”, if that’s not going to add value to the teach. There is no point in leaving the learners open to distraction with links to something unimportant—supposedly in a contrasting colour, without or without even more attention-grabbing blinking animation. And if something doesn’t add value, it invariably decreases it. It’s all about convincing the client as to the necessity of a course component. That’s why it’s always worthwhile to talk to the kingpin, like the CEO, and not an intermediary, like a training manager or project manager. A CEO should be reliable enough to prefer a new and worthwhile, and obvious, thing to a tried-n’-tested and superfluous one.